NASA astronaut Nick Hague will head out for his second spacewalk on March 29. He completed his first spacewalk on March 22, when he and NASA astronaut Anne McClain replaced some old batteries on one set of the International Space Station's solar arrays. NASA astronauts Christina Koch and Nick Hague are scheduled to spend about 7 hours working outside the orbiting laboratory to continue ongoing work to replace the aging batteries that store power collected by the station's solar arrays. 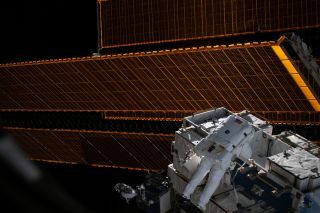 The spacewalk will be almost identical to the one Hague did with NASA astronaut Anne McClain last Friday (March 22), when they replaced six old nickel-hydrogen batteries with three new lithium-ion batteries on the station's P4 truss. You can watch the entire thing live here on Space.com, courtesy of NASA TV. The spacewalk will begin at about 8:20 a.m. EDT (1220 GMT), and NASA will begin airing live coverage while the spacewalkers are getting ready at 6:30 a.m. EDT (1030 GMT). NASA astronaut Christina Koch gets fitted in her spacesuit ahead of her first spacewalk, scheduled for March 29. Today's spacewalk was originally supposed to be the first one carried out by only women. However, a spacesuit sizing issue led NASA to change those plans — a decision that was prompted by safety concerns from McClain, who would have joined Koch for this spacewalk. After taking her first spacewalk together with Hague last Friday (March 22), McClain realized that the suit she had planned to wear for her spacewalk with Koch would not fit properly, because it was too large. Both women would have required the same medium-size suit, of which there was only one readily available, and the crew did not have time to prep another suit, NASA officials said. Instead, NASA reassigned McClain to a future spacewalk and had Hague take her place — a decision that sparked outrage among feminists on social media. "Given the very busy operational schedule onboard the station this spring — the spacewalks as well as several resupply missions that will begin arriving in April — the teams made the decision to keep the schedule by swapping spacewalkers rather than reconfiguring a spacesuit," NASA spokesperson Stephanie Schierholz told Space.com. So, the world will have to wait a bit longer to witness a tremendous milestone for women in space, but "an all-female spacewalk is inevitable," NASA officials said in a statement. The fact that McClain and Koch were scheduled to take a spacewalk together in the first place was merely a coincidence and not a deliberate choice. "There was a lot of circumstances that got us here, but in terms of these two females going outside, it all starts with competence and capability, and they just happen to have it just like every other astronaut has it," NASA's space station program manager Kenneth Todd said in a news conference on March 19. McClain will still have at least one more chance to take a spacewalk during her current mission at the space station. On April 8, she will head out with Canadian Space Agency astronaut David Saint-Jacques to lay out jumper cables that will establish a redundant power supply to the station's Canadarm2 robot arm. The spacewalkers will also upgrade the station's wireless communications networks. Saint-Jacques will wear the large spacesuit, and McClain will wear the same medium suit that Koch is wearing today.